Digital Rights Management (DRM) is a major bone of contention between consumers of music and video and the producers of such entertainment. Producers want to control their copyrights, dictating where, how, and even how long consumers can use their creations. Consumers – buyers or customers, to give them their rightful names – want to use their purchases, their property, as they see fit. After all, when you buy a book it doesn’t open only when you are sitting in a specific chair, and it does not burst into flames and vanish after a certain period of time. Why should digital entertainment be any different? The real reason is that DRM allows producers to profit several times per customer from the same piece of entertainment. In a producer’s ideal world, you would have to buy a license to play a song on your iPod, another one to play the same song on your computer, another license to play the song on your CD player, and so on. And if the producer feels like it, he can make the song erase itself after a certain period of time. That way, you only rent the song, you can’t own it perpetually. You have to keep paying and paying over and over again. “No,” say customers resoundingly. They strip DRM copy-protection off music and video files as fast as they can. An entire industry of software developers keeps abreast of the latest DRM copy-protection schemes and knocks them down as fast as they appear. Is this circumvention of DRM legal? Yes, because courts have ruled that customers have the right to make backup copies of the files they purchase to protect their investments. What you do with the backup copy you create is your business. The simplest way to remove DRM from WMV and WMA files is to burn the files to a CD and then rip the CD to your computer’s hard drive in MP3 format. That should remove most DRM from the MP3 files. But this method is slow and puts a heavy strain on your CD-ROM drive. A much faster and more versatile DRM remover is the Daniusoft Digital Music Converter. Its intuitive interface lets you quickly remove DRM from music such as DRM WMA, WMV, M4A and M4B, M4P, M4V(iTunes), so that you can convert DRM protected music without any restrictions. You can convert DRM music between various formats including MP3, AAC, WAV, M4A, APE, AC3, WMA, etc. 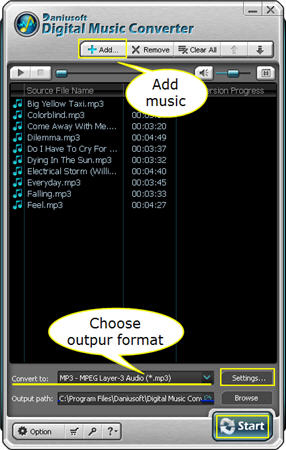 It will extract audio track from DRM video file so that you can copy DRM music and enjoy the music on different players such as iPod, PSP, PS3, Zune, Creative Zen, Archos, etc. It converts batches of files at once, too.